Visionscape .NET Controls are some of the most powerful tools in the Visionscape toolkit. Applications such as FrontRunner and AppRunner which may be familiar to you are built using the same controls. These tools allow developers to create custom user interfaces which interact directly with Visionscape. When FrontRunner and AppRunner are unable to help you push through the last 10% of a job, Visionscape .NET controls give solution engineers an invaluable capability to finish and complete their smart camera or GigE solution. Congratulations on becoming a proud owner and user of the world’s smallest and most versatile smart camera platform! Based on feedback from other people such as yourself that are eager to get started, we’ve created a new step by step video series guide to walk you through all the different areas and features you’ll need to know about. Does size matter? In our industry – YES! Space, or the lack of it, can be a challenge when placing barcodes or Data Matrix Symbols on different components. As laser printing technology advances, so does the ability to print smaller and smaller codes onto a variety of surfaces via DPM (Direct Part Mark) and 2D symbols. The size of the code, the type of material it’s printed on and the curvature of the surface are huge factors when trying to read tiny codes and keep costs down. Even if you have the space to place a tiny code, how do you read it? In industrial manufacturing, last thing you want to deal with is unreadable barcodes interfering with production. Decoding failures may require downtime for diagnostics and equipment adjustments, which results in unforeseen costs, lost opportunities to meet business objectives, and a lot of frustration. After all, using barcodes in production is supposed to streamline operations, not complicate them. How Many Clicks Does it Take to Get Industrial Machine Vision Integration? There is not one perfect, turnkey automation solution to fit every manufacturer. With so many possible operations to automate, the procedure and tools required to implement or upgrade an automation system are almost always entirely unique from every system that has ever been implemented before. 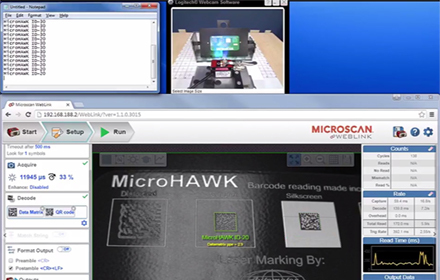 Microscan Link - How Fast Can You Integrate Machine Vision? With the release of Microscan's AutoVISION 2.0 software, our simplified machine vision suite is now equipped with even more features to make setting up and deploying vision inspection jobs - from simple to complex - even easier. One new feature is Microscan Link, AutoVISION's one-click connectivity tool.